The magic of the holidays comes to life on this most stunning illuminated tour of Washington, DC this holiday season! Take in the beauty of its festive décor and be in awe as you travel through the City streets with its twinkling lights. You’ll visit the grounds of the U.S. Capital, Lincoln Memorial, and the White House Ellipse – walking through the “Pageant of Peace”. Your tour will be led by a licensed DC Tourist Guide who will share stories about the history of this national festival, and its fun and historic local roots. 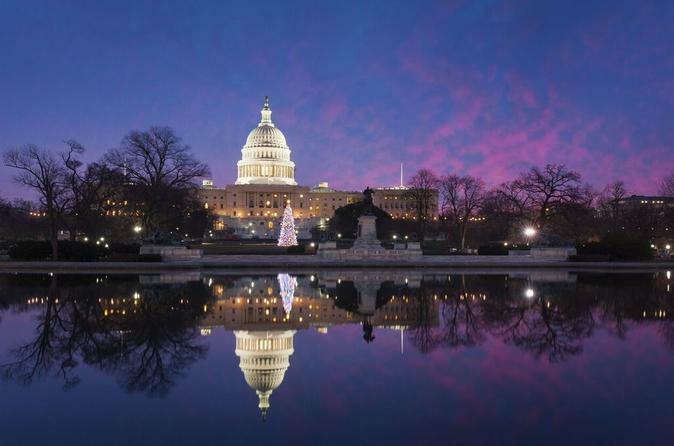 Our first stop will be the West Lawn of the U.S. Capitol to view “the People’s Tree” evergreen Christmas tree….which has been displayed on the West Lawn of the U.S. Capitol building since 1964. It is called the “People’s Tree” because this fresh-cut tree comes from public land in a National Forest. Each year, the lighting of this tree marks the start of the holiday season on Capitol Hill. This majestic, illuminated tree shining in front of the U.S. Capitol is a unique and beautiful part of the Capitol’s holiday season. The tree is over 65’ tall and is decorated with 10,000 hand-made ornaments and lights to make it shimmer! It is a tree from the people, by the people, for the people. Everyone is invited to stand in its glow! Next stop is, the White House Ellipse, where you’ll appreciate the beauty of our nation’s National Christmas Tree! Guests will disembark the shuttle to visit D.C.'s own "Pageant of Peace”. Since 1954, the Pageant of Peace has been held on the Ellipse by the White House. It brings our local and national communities together and symbolizes America’s wish for peace around the world. The centerpiece of the Pageant is the National Christmas Tree decorated with thousands of beautiful twinkling lights. With the backdrop of the White House, it is one of the most glorious holiday sites in D.C.
Radiating out from the National Christmas Tree are 56 additional Christmas trees - decorated with hand-made ornaments from each state, territory, and the District of Columbia. A life size Nativity Scene and 20’ tall Menorah are also on the Ellipse. Music from local choirs and bands perform. The illuminated Washington Monument, White House, Christmas trees with thousands of ornaments come together to cheer your spirit and warm your heart with peace and joy! Our last stop is the Lincoln Memorial, where all experience breathtaking views of the National Mall, with a clear view of both the Washington Monument and U.S. Capitol Building; a photographer’s dream. Be prepared for great holiday cheer! Season’s greetings!